I finally got the last border on the Steelers Quilt! Although I counted most of the top out when I finished that, so I just get to count the last border. I also mailed off four giveaway fat quarters. Enhancing someone else's stash report! My LQS gives you 15% off for your birthday, so I picked up...almost nothing. I guess that's what happens when your birthday is so close to Fat Quarter Frenzy. I grabbed two yards of my favorite neutral, a half yard of the neutral in my Tennessee Waltz quilt, the panel for my Saturday Sampler, and the next sampler block. 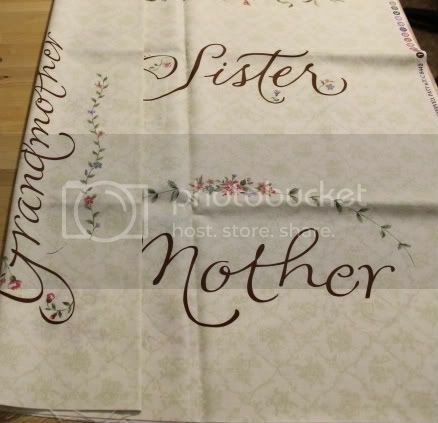 The panel says Mother, Daughter, Sister and Grandmother - it'll be pieced into the backing. In addition, my husband and I started a pay-per-mile running program. Run a mile, get a dollar - his for computer games, mine for fabric. Luckily, we made the deal on Wednesday, the day after I picked up my neutrals. So now I really have to earn each yard...or work from my stash.